Lystaii 100pcs Utility Clips, Multipurpose Clothesline Clips Bag Clips Steel Wire Clips Clothes Pegs Pins for Drying Home Laundry Office Cord Clothespins Fastener Socks Scarfs Assorted Colors by Lystaii at Community Frontiers. MPN: 100 cloth clip. Hurry! Limited time offer. Offer valid only while supplies last. 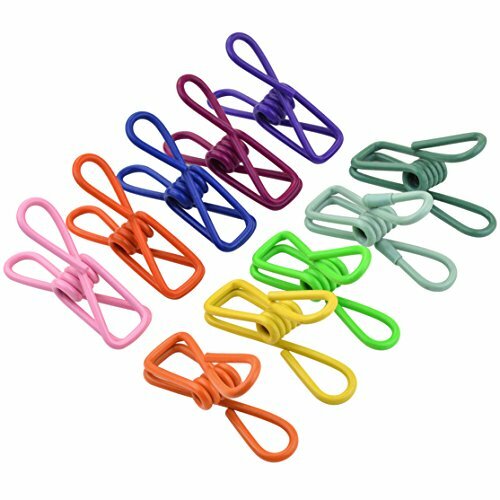 PACKAGE INCLUDE : Package include 100pcs utility clips.Assorted colors: total 10 colors, 10pcs for each color. Small and exquisite, beautiful appearance.These clothespins clamps will help you save money in more ways than one. SIZE : 2.17" X1.18" X0.67"(5.5X2.8X1.8cm)(L*W*H).Multi-purpose clips for clothes line, bag sealing, paper files clips, clip socks, and other snacks seal , Use for small objects in life/office etc. MATERIAL : Metal clips with vinyl plastic coating, Rustproof, Durable and Reusable.Unlike plastic or wood clothespin, they have good grip and do not rust, bend or fall apart,windproof and durable. MULTI-FUNCTIONAL: Multi-function, you can use it to hang up wet clothes outside, great clips for securing open bags of potato chips, hanging lights,hang things on bulletin boards, walls, from nails or hooks, from strings, as chip clips and paper clips. USED IN MANY PLACES : They work perfectly for clothing in the laundry room or closet, towels in the bathroom, and for plastic bags in the kitchen. Use these clothespin clamps anywhere in the home. View More In Hooks & Hangers. If you have any questions about this product by Lystaii, contact us by completing and submitting the form below. If you are looking for a specif part number, please include it with your message.